Antique Civil War Era Sepia Photo Gilt Gesso Frame 25" x 19" Convex Bubble Glass. 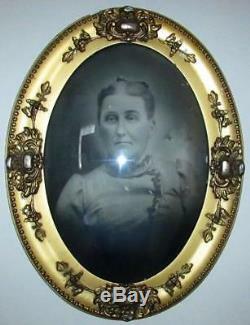 Antique lemon gold gilt / gesso frame measuring - very large "Instant ancestor" photograph: Civil War era sepia photograph of woman in period clothing Actual measurements: 24 7/8" x 18 7/8" Frame is in overall very nice condition but does have some small chips (nothing egregious). Please view on computer and enlarge pictures for best idea of overall condition. 43B18 Please look closely at the pictures and consider them part of the description; we are describing what we see but you are the expert. If our item is described as VINTAGE or ANTIQUE, it is old and should never be expected to look "like new" as they are usually used items. Understand that color or image quality as displayed on your computer may not be exactly as the item appears in person, but we do not alter our pictures. Since we are from the historic northeast section of the United States, we have access to many of the early and unusual items from our country's past. We are pleased to be able to make these items availabe to those in other areas of the United States and worldwide. Thank you for visiting AntiquesEtcetera! Auctiva offers Free Image Hosting and Editing. The item "Antique Civil War Era Sepia Photo Gilt Gesso Frame 25 x 19 Convex Bubble Glass" is in sale since Thursday, November 1, 2018. This item is in the category "Antiques\Decorative Arts\Picture Frames". The seller is "dustydaffodils" and is located in Macungie, Pennsylvania. This item can be shipped to United States, Canada, United Kingdom, Denmark, Romania, Slovakia, Bulgaria, Czech republic, Finland, Hungary, Latvia, Lithuania, Malta, Estonia, Australia, Greece, Portugal, Cyprus, Slovenia, Japan, Sweden, South Korea, Indonesia, Taiwan, South africa, Belgium, France, Hong Kong, Ireland, Netherlands, Poland, Spain, Italy, Germany, Austria, Israel, Mexico, New Zealand, Philippines, Singapore, Norway, Saudi arabia, Ukraine, United arab emirates, Qatar, Kuwait, Bahrain, Croatia, Malaysia, Chile, Colombia, Costa rica, Dominican republic, Panama, Trinidad and tobago, Guatemala, El salvador, Honduras, Jamaica.